Where we live in Minnesota has terrible water. It’s full of junk, tastes nasty, stains our clothes, and causes all sorts of problems with our coffee maker. It was hard for me to drink the water, even after running it through a Brita filter. I would hold my breath a chug a glass of water so I couldn’t taste how bad the water was. My water consumption plummeted once I got home. Some of our friends have bottled water delivered to their houses. It seemed expensive, and we were right. Not counting Burgers and Boardgames Night, where we can have as many as 15 people in the house, we have two adults, two children and three dogs in the home. Our baseline monthly consumption put us in the middle tier for quantity — and therefore cost. 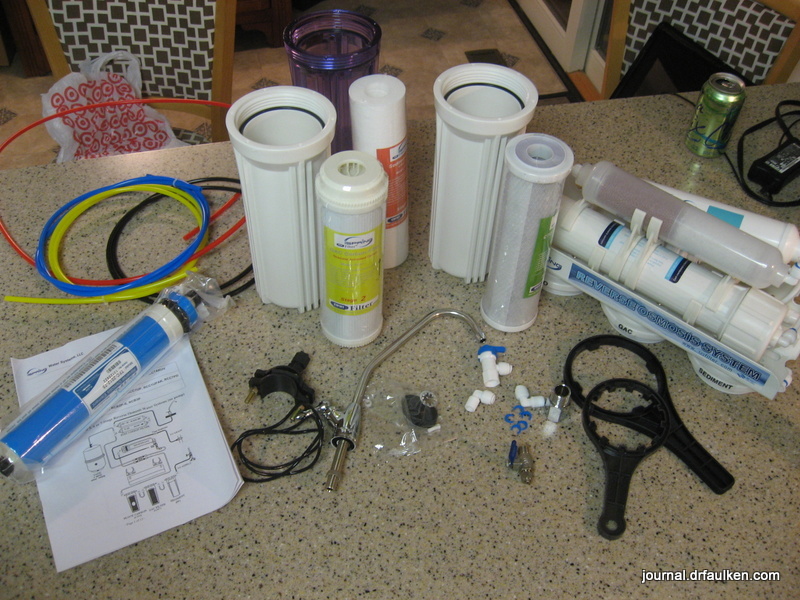 When I wrote about the water quality here some of my readers talked about installing an in-home multiple state reverse osmosis water filter. I was told to expect between $500 – $600 for a good unit. That seemed pricey to me. However, it would have been cheaper than bottled water delivery services. Even better, it looks like a lot has happened in two years to drive the cost down on reverse osmosis filters, and I bought one delivered to my home for $206 via Amazon Prime. I’ll review the iSpring 6-stage unit later: this post is about installation. Which Sedagive? and I did ourselves. It was really easy, especially once I figured out the one step I was doing wrong. 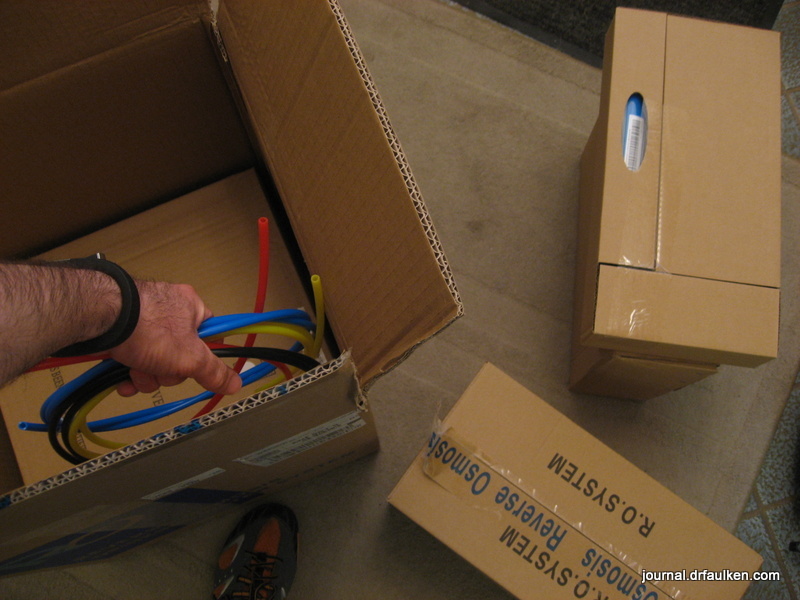 The iSpring arrived in one big box. 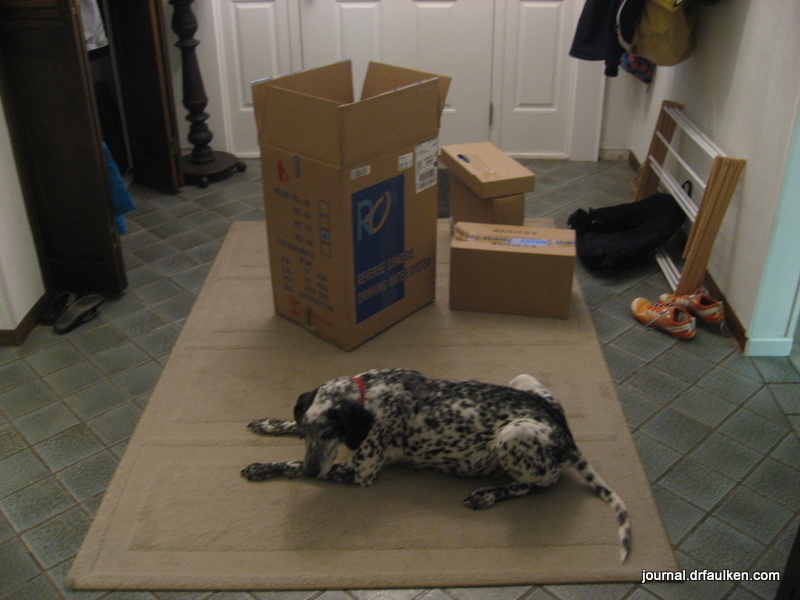 The tank was in one box, and then the other components were packaged in two other boxes. 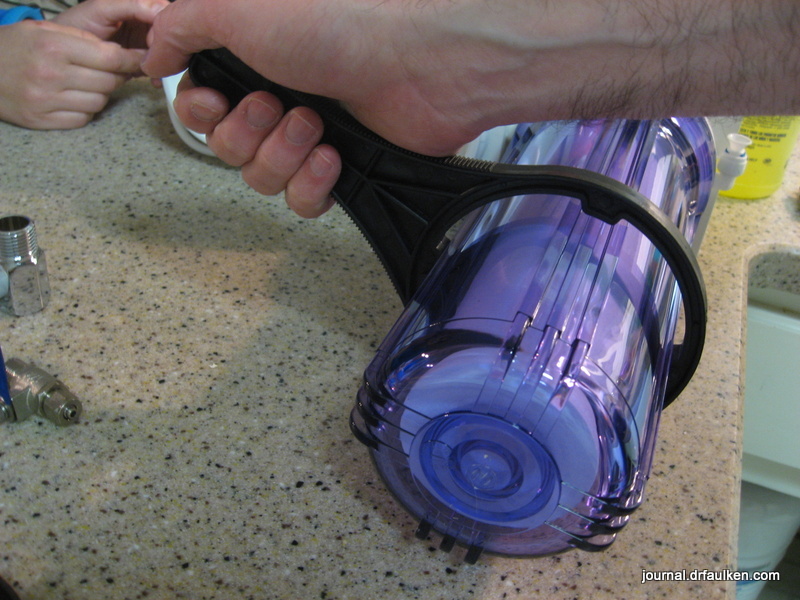 The iSpring model I bought holds up to three gallons of filtered watery goodness. For the most part everything was straightforward. The instructions state to assemble these while the unit is standing up, but for ease we did so on the unit’s back. Everything was fine. Tighten with the included wrench. 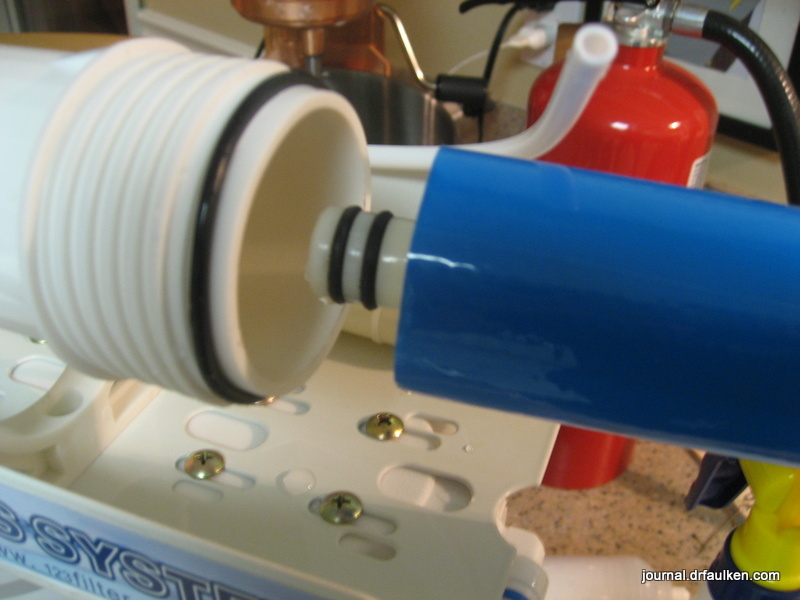 The membrane filter is installed next. The video recommended not touching the membrane, so I wore a nitrile glove while installing it. Make sure you push hard enough for the filter to seat properly. 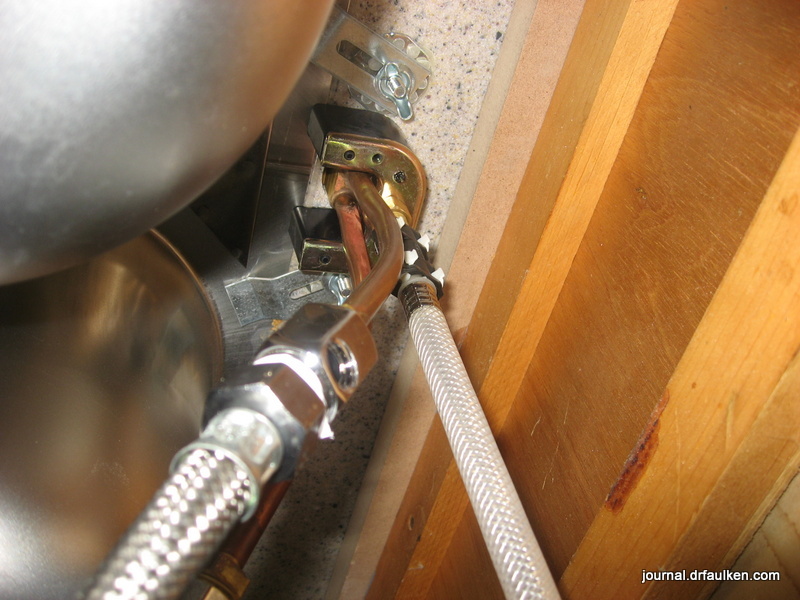 The next step is to install the included threaded nut that allows for the cold water supply to run to the filter. Make sure the water is shut off from this point forward. This step was easier than I thought it would be. Teflon thread tape is recommended but not included. Luckily I had some. No leaks so far!! Next is a valve that controls the flow of water to the filtration system. The design of this is a little weird, and caused my only problem with the installation. More on that in a second. The different colored lines are all the same, but are referenced by color in the instructions. This was helpful to me. This red line feeds the house’s cold water into the filter. At this point we connected all the lines up, including the yellow one that went to the three gallon storage tank. 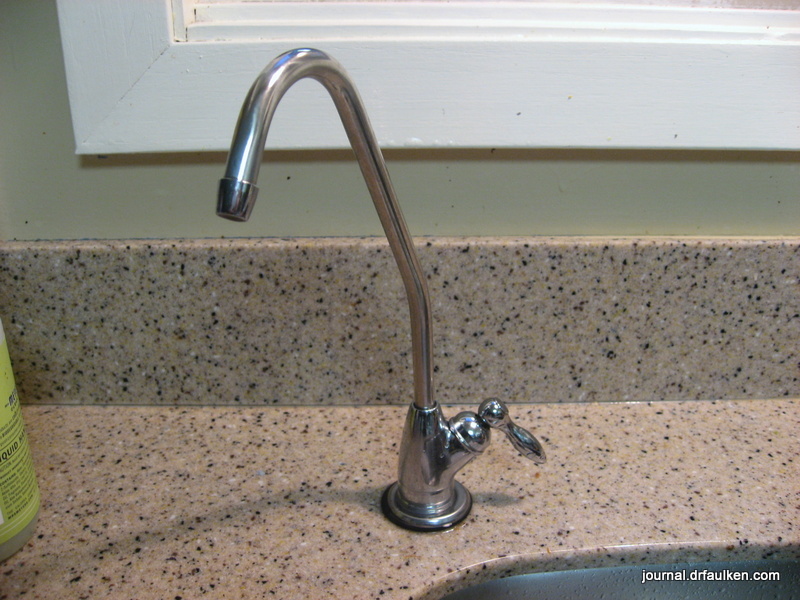 Next is installing a plastic “saddle” onto your drain. 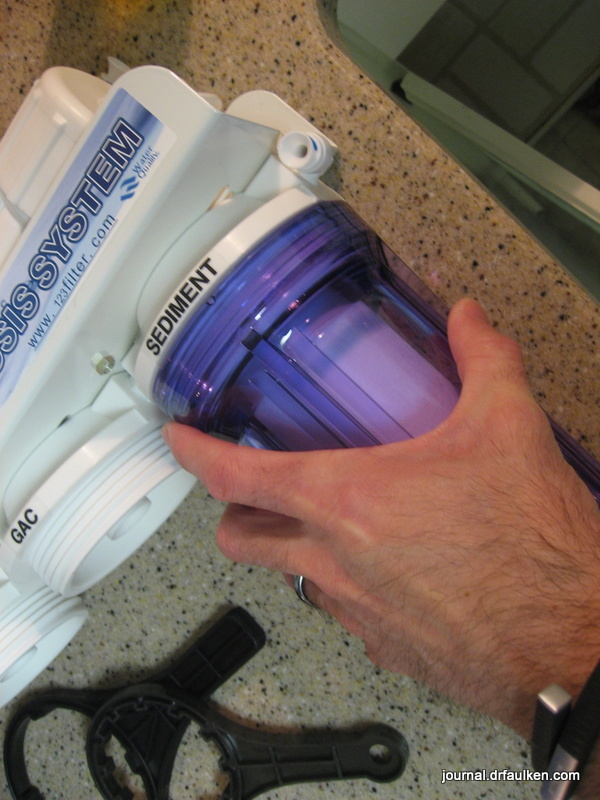 This allows the waste water from the reverse osmosis unit to drain out into your plumbing system. This was by far the most difficult piece to install. First, drill a hole in the existing drain pipe that’s just big enough for the plastic tubing, but not too big that it comes out. Next you stick a foam piece with a hole in the middle over the hole you drilled. Then you have to put a plastic shackle over the foam piece, tighten it down, and thread the plastic tube in. Everything was fine until I had to put the tube in. Holy crap was it annoying. I made sure I had the holes all lined up with a pencil but I couldn’t get the plastic tubing to go in. I wound up drilling a slightly larger hole than recommended in the instructions. Sedagive? took over for me before I lost my temper, and we moved on to the next step. The next thing I did was install the water dispenser. The easy way out was to remove the sprayer and use the existing hole in the counter top. We wanted to keep our sprayer, so I wound up drilling a hole in the counter near the sink. I started with a small drill bit and used progressively larger ones until I made a 5/8″ hole. The written instructions had good tips on how to do this. The biggest problem with this step was that iSpring either didn’t include enough pieces (a washer) or changed the dispenser design and didn’t update their documentation. Either way the dispenser works just fine and doesn’t leak. This is where things get exciting: turn on the water. I slowly turned the water on and waited for a jet of water to spray me in the face. Nothing, not even a drip. That’s too good to be true, I thought. 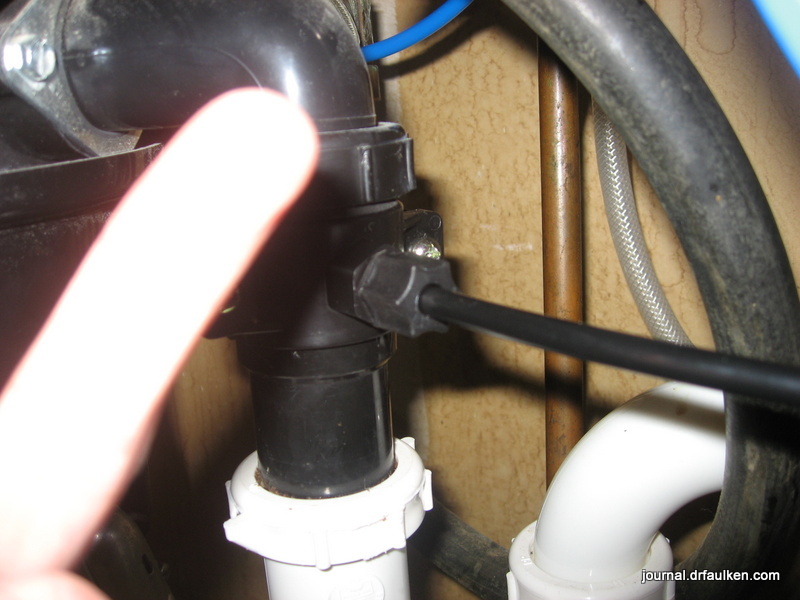 I turned the valve I installed (remember, the one with the red tube?) halfway. Water flowed from the main line down the red tube. I watched the water enter one of the filters. I let it run for another minute or so and then turned the valve I installed all the way. Full throttle! I waited for more spray; nothing. The directions state to open the dispenser full blast. Water is supposed to run after a short wait, and then you run the water for five minutes to clear the system out. I opened the dispenser and waited for water. And waited. And waited. At first I thought there was a block in one of the tubes. I extracted the entire filter mechanism and storage tank from beneath the sink. No kinks in the line. 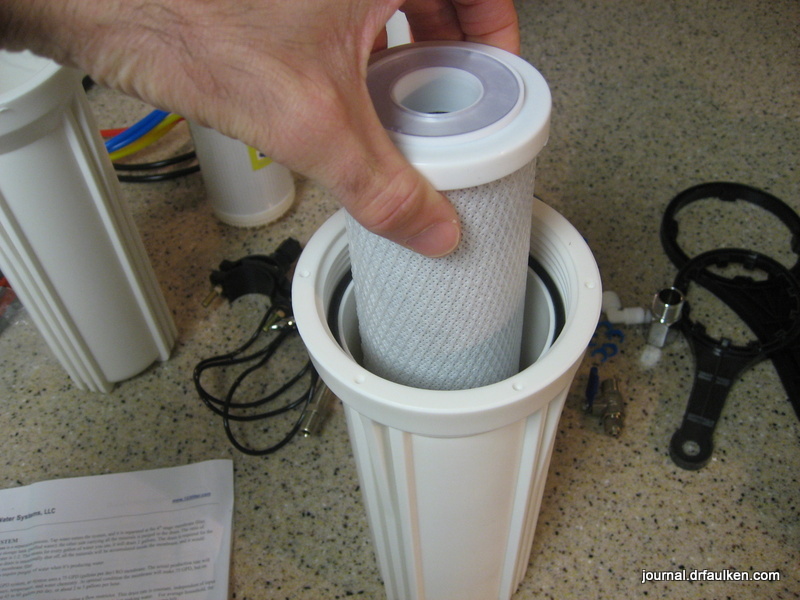 I then disassembled parts of the filtration system to see if there was water in each filter. Yup, water all the way around. 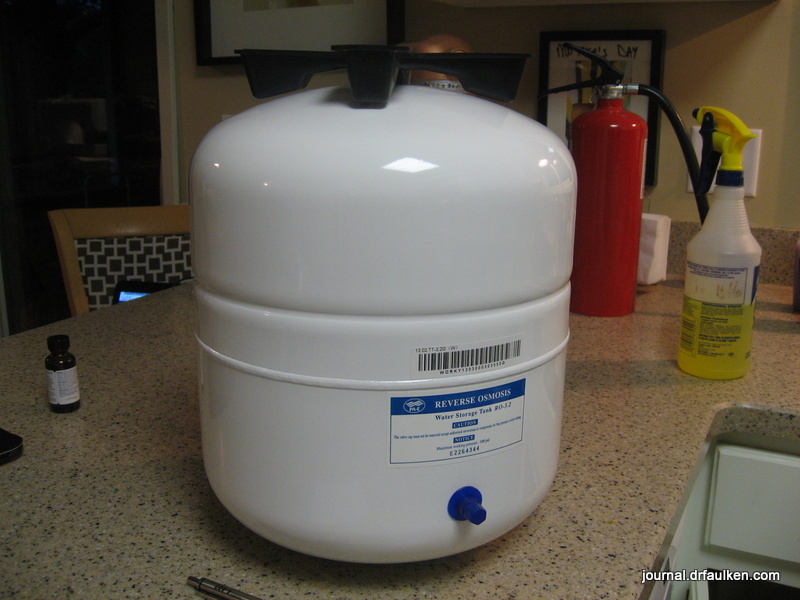 I searched online to see if my storage tank’s bladder had somehow become depressurized. All signs indicated it was okay. I figured that the water dispenser had to be left on for a REALLY LONG TIME, so I went to bed, half expecting to wake up to a massive leak with water all over the kitchen floor. I woke up nervously two hours later and went downstairs. Everything was dry, including the sink where our tasty filtered water was supposed to be. The next morning I tried backtracking my installation attempts. I couldn’t find any similar problems online. In a moment of desperation I turned the valve I installed back to its half / partial position. I could hear water rushing into the system, and then the sink. Instead of turning the valve to “fully on,” moving it straight down turned it back to off. I’m an idiot. 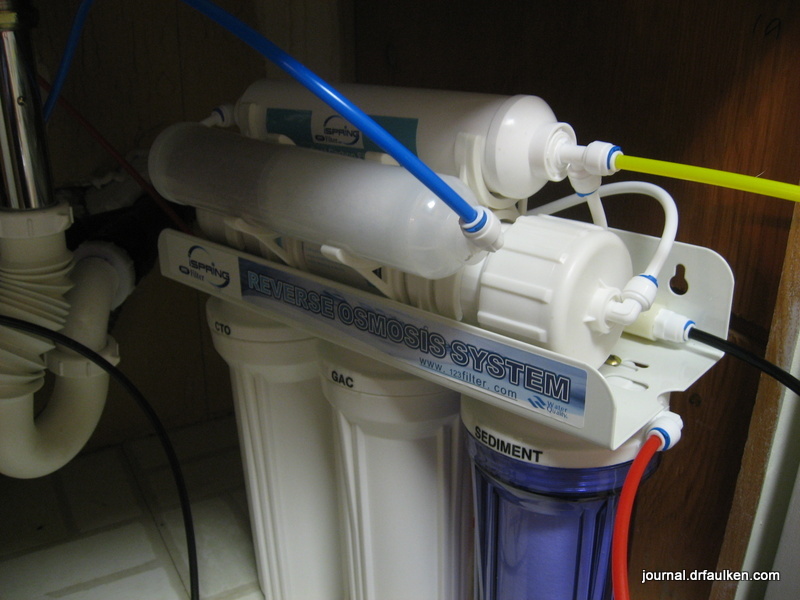 Ever since then the six stage reverse osmosis system has been running like a champ. We love it and it’s completely changed the taste of water and everything we make with it. We were blown away by how much better our coffee tastes, and we were making some good stuff to begin with. We’ve also managed to reclaim a lot of fridge and counter top space by ditching our two Brita systems. I can drink a glass of water without holding my breath, and our water glasses are no longer scratched by the particles in the water. I’ll review the system later, but with installation being this easy I recommend it for just about anyone. 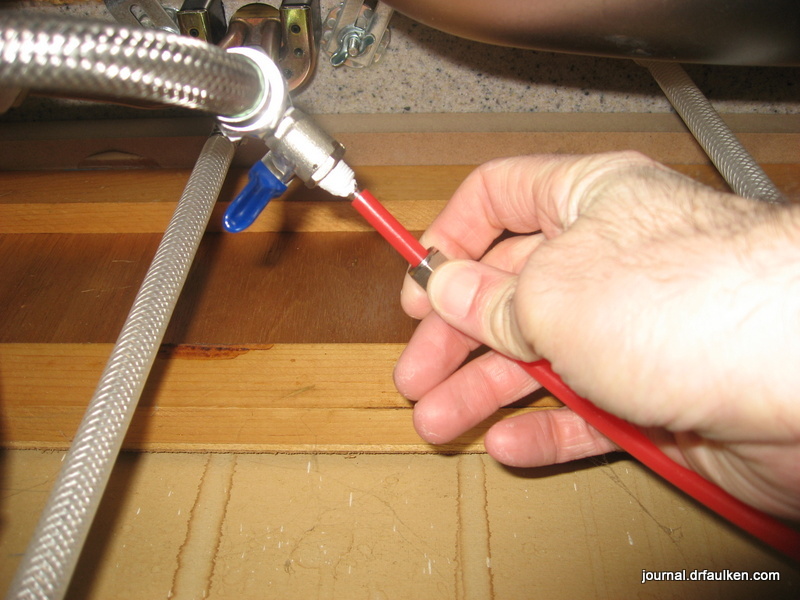 If you can use a drill and a screwdriver you can install this system. 1 Comment on "Installing an iSpring Reverse Osmosis Water Filter"
When I was 16 (1977) we lived in Braintree Massachusetts and our reservoir was downhill from Interstate 93. In the wintertime our water tasted salty from the road salt, slight hint of Uniroyal tires and just a touch of oil and antifreeze. This was in the days before anyone knew of sink tap water filters or (gasp, no bottled water) except the large bottled water like offices, but nobody ever thought of that. We used to take our summer picnic chest to my uncle’s house 20 miles away and filled it and everything else we could find from his tap water. I thought times had changed, apparently not everywhere. So nice to live in San Francisco where the water comes from snow runoff from a reservoir in Yosemite national park. I don’t even have to have a Brita.